Gastronomic meals are an essential componant of our painting workshops in Tuscany. Creative cooking is art. This is why we enjoy so much experimenting with new ingredient combinations and arrive to our own original recipes. We enjoy very much letting go in cooking as we do in painting by fining and refining our recipes such as Osso Bucco alla Borani, Just as the Machiaioli Artists did in Tuscany. 1. Make a few cuts in the outer membrane of the shanks so that the meat won’t curl up while cooking. 2. Season the osso buco with kosher salt and white pepper. Put aside. 3. Wet generously a skillet with olive oil. Add the sage leaves and golden brown them to flavour the oil. 4. Discard the sage leaves. 5. Add the yellow pepper juliannes and golden them. Put aside. 6. In the same skillet and adding more olive oil if necessary, golden brown the osso buco on both sides over medium heat. 7. Add the white wine, the orange juice and the turmeric and stir. 8. Cover and simmer for 1.5 hours. 9. 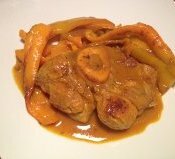 Halfway through the cooking time, turn the osso buco and add the yellow peppers . Sounds yummy! I wish I could be there to to taste in person. Now I understand why my osso gets curly! Next Next post: What will be the art of tomorrow ?